When you get out of Seoul and try your luck at traveling around the countryside you can end up in the middle of nowhere. This happened to me as I tried to bus my way to the garden location. Using my naver bus-map app I was told to get off at a certain bus stop, cross the street and transfer to the 2-1 bus. Well when I got across the street I noticed on the bus stop sign that it didn't list the 2-1 bus. I checked my app and tried to see if there were other bus stops around. But it seemed I was stuck out in the middle of nowhere. 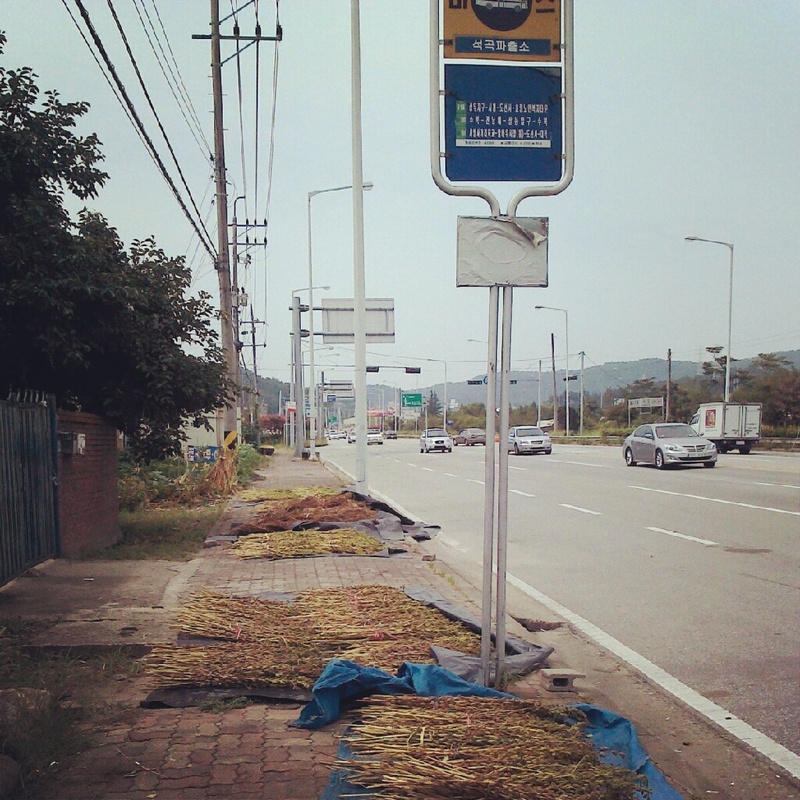 To boost the sidewalk made better use for drying crops than for letting pedestrians use them. I turned around and looked at my prospects for help. There was a store selling only fish nets, and besides this a police station. I thought I was in luck seeing the police station, as throughout my life the police in this sort of situation have been helpful. I walked into the police station and there behind the counter were 4 police men sitting comfortably with the air conditioner blowing on them. I asked them (in Korean) where was the bus I was looking for and gave them my hand written note of today's journey (with Korean on it). They chatted amongst themselves and then one of the officer's stood up and said, "Ok. You come with me." The next thing I knew I was in a Korean police car being escorted to the garden site, while trying to keep my excitement down. He didn't put on his seat belt and neither did I. Throughout the ride I tried to talk to him but my Korean wasn't up to par. Anyways it was a fun ride and he did point out things along the way such as a grape farm and a lake. I got to hear radio chatter on his system in the car, and notice the difference in people driving around him. He stopped at my destination and let me out, and we said goodbye. But this was by far one of the best experiences I have had in Korea and I'm sure gave him something to remember too. Entering the garden you first pay a little fee then head up a hill where you see a small stream and more bamboo trees. There really weren't many trail markers and I sort of just followed other people around to figure out where to go. However, it turns out this garden is compact and not really big enough to get lost in. It comprises of several structures, walls, a stream and of course gardens with budding trees. Korean gardens are meant to be at harmony with the surrounding nature and follows a Confucian attitude built during the Joseon period. So Yang made this garden to seclude himself from social position. The part of the garden was burnt down during the Japanese invasions of Korea (1592–1598), but the buildings were reconstructed by his descendants, and the present Sosweawon was renovated by Yang Taek-ji, Yang san-bo's descendant in the fifth generation. An 18th-century map of Sosweawon remains. It is carved on wood in the 31st year of King Yeongjo (1755), and shows the original design of the garden. For the most part you enjoy walking up and down the dirt path along the stone wall. As you do so a variety of trees shade your way and traditional Korean structures peek above the walls. The bubbling stream that passes through is a soothing sound for sore ears. Yet you do enjoy this attraction with many other people, and I think I got there early enough to beat the huge crowds. For the most part I saw families and couples enjoying a light snack or boxed lunch under pavilions. Babies got their picture taken in the stream, despite their protests. Overall a lovely stop to visit when in Damyang, but don't make it your whole day's adventure as there isn't much in the surrounding area. I noticed these ducks in the stream on my way back and considered that they were quite larger than the ones I see down in Seoul. When I finished up with the Soswaewon Garden I decided to walk down the road to where the lake was, thinking there would be a trail or some kind of place to look out over the lake. However, I didn't find such a thing and the hot weather was getting to me. So I headed back to the nearest bus stop and tried my luck. Along the way I walked past some lovely farmland scenery. At the bus stop I used my bus-app again to figure out which bus to take to get me back to Damyang or someplace familiar. Thankfully a young lady was with me and she suggested taking her bus to Gwangju. I did just that and ended up in the city, had a bite to eat then headed home. It wasn't the most packed day, but I was feeling a bit beat and figured I would rest in the pension (which I paid for). During my time in Damyang I enjoyed the amount of walking I did, especially when I got off at the last stop and walked up a sloping hill to my pension. Along this walk I passed a hanok village which was set in front of a lovely mountain scene. Mostly, all that walking was good meditation to clear the troubles that were on my mind from last semester.